Local food was featured on the school menu daily, totally more than 1.4 million meals featuring at least one local item. Students enjoyed produce from school gardens in addition to items sourced locally through a distributor, including romaine lettuce, squash, tomatoes, broccoli, beans, and more. Eleven schools have edible school gardens, including a 15 acre district-owned farm. Garden produce is often used for taste tests. 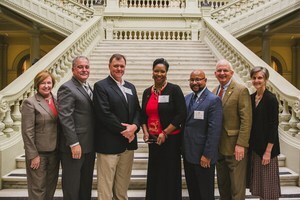 Pictured are Public Health Commissioner Dr. Brenda Fitzgerald, State School Superintendent Richard Woods, Tift County Schools Superintendent Patrick Atwater, Tift County School Nutrition Director Vanessa Hayes, Tift County Human Resources Director Kevin Dobard, Commissioner of Agriculture Gary Black, and Georgia Organics Executive Director Alice Rolls.